This ground breaking text/lab manual introduces significant concepts in the fields of Human Machine Interface (HMI) and Programmable Logic Controllers. Hands-on, step-by-step activities provide experiences in creating various process-control applications with HMI devices and software—programming that enables an HMI system operator to interface and interact directly with the system. This book is ideal for introducing high school and college students, plus those in the professional fields of process control and automation, to the capabilities and potential of HMI. 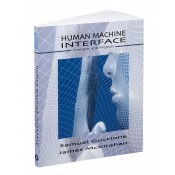 Notify me of updates to Human Machine Interface Concepts and Projects Sale!